Vitamin E, which is known for its antioxidative capacity, is sensitive to oxygen, temperature, and light. 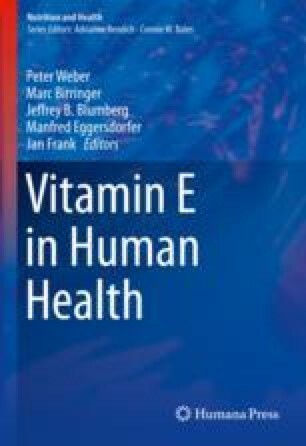 This work investigates the stability of vitamin E in foods exposed to different environmental conditions, including various processing technologies. For vegetable oils, e.g., the maturity of the seeds, the method of pressing such as roasting time, temperature, and refining steps, and storage conditions and ways of household usage are critical factors of impact on the foods’ vitamin E content. Among the processing steps, reducing the foods’ storage time, its moisture content, and its exposure to air oxygen are most effective to limit the losses of vitamin E in, e.g., oils, nuts, vegetables, and meat. In bread, whole wheat products demonstrate higher vitamin E contents compared to products made from flour subjected to higher degrees of grinding since vitamin E is lost upon removal of the aleurone layer and the germ vitamin E becomes more prone to oxidation. Moreover, evaluation of the impact of different cooking methods and heating temperatures applied revealed a relative increase in vitamin E levels upon frying of vitamin E-poor vegetables in vitamin E-rich oils due to the loss of water and the absorption of vitamin E from the frying oil. Roasting has also been identified as a factor of impact since differences in vitamin E contents between oils obtained from roasted seeds and oils extracted from unroasted samples have been reported. Here, the results are not homogenous, depending on the type and amount of antioxidative Maillard reaction products formed upon roasting and on the extraction procedure applied afterward. In order to meet the daily recommendation of an adequate vitamin E intake, all of these factors of plant production and food processing should be considered within a balanced diet which should include vegetable oils. USDA Food Composition Databases. Beltsville, MD. https://ndb.nal.usda.gov/ndb/nutrients/index. (2017). Accessed 22 Nov 2017.